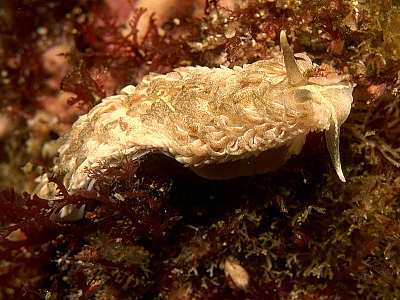 MOLLUSCA : NUDIBRANCHIA : Aeolidiidae SNAILS, SLUGS, ETC. Description: This is the largest Aeolid in the British Isles. It is usually grey in overall appearance due to freckles of grey or brown pigment, but the colour is very variable. There is usually a V-shaped white mark on the front of the head with its base between the rhinophores and arms running out to the oral tentacles. The oral tentacles and rhinophores are tapering with thick bases. The cerata are somewhat flattened. 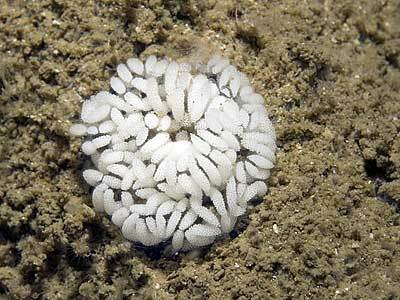 Habitat: Aeolidia filomenae feeds on sea anemones, taking a wide variety of species. In the intertidal the normal prey is Actinia equina, though Anemonia viridis is also taken. The spawn is distinctive, consisting of a thread coiled back and forth and laid in a spiral. Distribution: This species has been reported from Scotland south to Atlantic Spain and France, but appears to be replaced by Aeolidia papillosa in colder waters. Similar Species: Aeolidia papillosa is now known to be a distinct species. It has uniform mottled coloration on the head and no pale V-shaped mark. The cerata are almost round in cross section. Most reports of Aeolidia papillosa from rocky shores in Britain and Ireland are probably this species. Large Aeolid with superficial pigment over body and cerata. Usually has a white V on front of head. Picton, B.E. & Morrow, C.C. (2016). Aeolidia filomenae Kienberger, Carmona, Pola, Padula, Gosliner & Cervera, 2016. [In] Encyclopedia of Marine Life of Britain and Ireland.